You won't believe what I found today right here in my own town!!! A Fiber Art Show. Our Arts Council put on a Fiber Art Show at a really cool location, the 577 Foundation. The 577 is an interesting place. To learn more you can click here. Company was coming for dinner so I had to "hurry" through the show. I figured better to see it quickly than not see it at all. There were some absolutely beautiful creations in fiber on display. I asked permission to photograph and was pleased to learn that would be OK. I just had to share this experience with all of you. My Viewers Choice went to "Marrakesh Espresso" by Anne French (of Toledo, OH) and Nancy Beeman (of Whitehouse, OH). I could not pull myself away from these pieces. I kept taking pictures hoping I was capturing the texture, color and shape of the pieces. Two artists collaborated to make these pieces. So I am wondering who gets to take them home? I am definitely not for cutting the baby in half. My thoughts are to help/assist these artists by storing their work at my house where they each could visit....supervised visitation of course : ) So thoughtful of me don't you think? I took lots of pictures at the show but don't have time just now to post all of them. I will definitely get back to posting more of the photos soon. Another Quilt Market Oooooooo Ahhhhhhhhhhh!!! I must have a "Creative Spirit" cuz I was a luv-in these patterns and fabrics. These are so fresh and eye catching....eye candy baby!!! I want pajamas in the fabric of the little girl top and pants here. I must have walked past Indygo Junction 14 times....I just could not get enough. I think they have a playful spirit and an obvious appreciation for fun clothes. I have often thought that clothing for adults are no where near as fun as clothes for kids. Someone at Indygo Junction obviously had the same thought and set out to do something about the situation. The little boy pajamas will be in gift boxes for my boys this Christmas. My Mom usually makes the boys p-j's so I might just buy the pattern and fabric and pass them along.....spoiled....yes!!! My Mom sews clothing, drapes, tablecloths and even reupholsters sofas and chairs. Not me....nope...I'm spoiled....I just make fun things (my idea of fun things). I've never read a clothing pattern I understood and the idea of making a sofa cover freaks me out. You can find the Indygo Junction patterns here. I really want some PJ's out of that fabric....anyone willing to enable me to continue with my pattern reading dysfunction? Thank you to all who left comments and check back soon because there will be more giveaways.....ya just never know when. Now that your legs are swinging back and forth under the porch swing, the breeze is flowing through your hair and you are enjoying the smell of the ocean......let me tell you about meeting Jan Carr, COO, at Clover. Mary Jane called on my cell phone telling me she had found a wonderful thimble and I needed to come right over to the Clover booth. I'm not a very good hand quilter so I was not very excited about a thimble. I might as well be going over to see a shoe box. However, to Mary Jane finding a great thimble is like seeing the red ruby slippers!! She owns at least two dozen thimbles, some of which she likes and others she doesn't. Mary Jane is my "Thimble Expert". She has so many blue ribbons for her hand quilting work that her son had to make special accomodations in her sewing studio for them..... so she knows her hand quilting and thimbles. I arrive to find Mary Jane talking to Jan Carr about The Protect and Grip Thimble . Jan shakes my hand and gives me a pretty green Clover pin and a Clover Tape Measure. Not a bad way to say hello!! Mary Jane is very enthuastiac about this thimble and the way it fits. What does Jan do? He gives it to Mary Jane along with 4 others to use for her classes. In business, a hand shake usually is appropriate but this was no usuall business transaction....I lost myself and gave him a big hug of appreciation. The other gals did too. I ran right home and put The Protect and Grip Thimble on my website. It comes in Small, Medium and Large. Minimum purchase is 3 (cuz you'll loose one down the chair cushion or put it in a project bag and you'll need another one, right?) Then you'll have to share one with a quilting friend because that's how quilters are....generous and love to share their best finds. The Gathering of Quilters last meeting (they meet Sept-May) was last week and the challenge was quilted purses. The purses entered were beautiful but one in particular caught my eye. What do you think? Would you vote for Rosemary's purse in this new category? Leave your comments here on my blog....as many as you like....you won't be sorry....guaranteed! I met some very fun people while at Quilt Market. On Thursday when I arrived the garage at the convention center was full. So I drove about 5 blocks and parked in a lot. I figured 5 blocks would be no big deal to walk. What I did not think about was that I would be leaving after 10 PM and I had not written down the name of the street. I left the convention center and started walking in the direction that I thought I had parked in. Mind you I have all the stuff I bought at Quilt Market in 2 bags over my shoulder. That fabric was heavy (not too heavy however....I would never have considered sitting it down!!!). I walked a few blocks to discover I did not recognize anything. I turned around and walked into a building that said transportation on it. I ran into three gals who had name tags on from the Quilt Market so I asked if they were familiar with the area. One tries to help me with her map and then the other gal said...."come with us we'll help you find your car." So I go with them.....for all I knew they wanted to take my stash....thankfully they didn't. Come to find out it was Lacey Hill and Carol and Nancy from Quilt Woman.com. They were soooo kind. They helped me find my van and waited until I was totally loaded and driving before they drove away. I was fed then driven to my van. That was after I was given tons of gifts ....and I'm not dead or dreaming. It really happened. My friends and I stayed at a hotel near the Pittsburgh Airport on Friday and Saturday. I figured that being so far away from the convention center we would not be running into people from the Quilt Market. I was wrong....again.....On Friday morning Lois met some gals while having breakfast that were going to Quilt Market too. They told her about their product, GrabARoo's. On the way to the convention center, Lois says we just have to stop by and see the gals from GrabARoos. Well, I'm not a free motion quilter and I'm guessing I'll never be one either, so I was not very interested. Lois would not let up. She was so geeked about these gloves that I was not getting away from going over and seeing these gloves. Once I put a pair on I was convinced....these are very useful gloves. They are nylon with finger grips on both sides....so if one side gets used quite a bit you can just flip them over!!! They did not snag on my rings when I put them on. I was impressed that they fit me because I have large hands (feet too) and it is difficult to get gloves (and shoes). When I got home, I put on a pair and started moving my fabric around and it was easy to grab....they're not kidding. They really work....I just love it when things "really" work...don't you? Lois used to work for the Post Office and she just knew the folks over there at her Post Office would love them. So she got a pair for herself and two for the two people at the Post Office (she does not live in a very big town...hence two postal clerks). Now I must say I'm a convert now....I really like them and I use them when I'm sorting my paperwork. I gave a pair to my Post Man and he was thrilled. He said they are great when he has to sort the mail because the paper is easier to grab and it does not deplete the oil from his fingers (touching paper all day dries out the hands). He also thought they would keep the wind off his hands in the fall and winter and still allow him to be able to grab the stacks of mail to put in mailboxes. I'm not being paid by these gals....I'm telling the truth, the whole truth...and nothing but the truth. They were soooo generous....they gave me a few pairs to use as a giveaway on my blog....so if you want to win a pair....guess you better keep-on-a-readin. You will be glad you did. I have had an extremely difficult day. My son is ill and had to return to the doctors. My dog is ill and he had to return to the vet. He may need to be visit that rainbow bridge place soon and I just can't deal with that. I'm out on the porch tonight and I see a box....I could not believe it. It is from Virginia, the creator of the Easy Reach Thread Carousel. It is the size that I would imagine a Thread Carousel to be in. But why is she sending me one? My heart is pounding and I run into the house and open the box. Here is a beautiful card with such kind words and this lovely gift. Talk about take my breath away. Isn't she a beauty? I think I will name her Bella. I can't wait to run downstairs with the little energy I have left and put the dowels in and load her up. So I'm going to sit down and write Virginia an e-mail when I see a comment on my website that says how nice my bag tags are. Then I remember that Little Birdie Secrets is doing a reader appreciation give away and I had offered to give 4 bag tags. So I click on over to Little Birdie and what do I see....Lovely words written about me. Yes this is a pix of my computer screen. I know you can somehow copy and paste web pages etc...but this is more personal....the actual screen that I was looking at....makes it more real...don't ya think? I hope you all have a Biscornu day soon too!!! I'm so full of joy and appreciation for the kindness that has been shown me this day. Virginia and Little Birdie....THANK YOU so very much. Truth be told....we are great friends and we went with other great friends and we all shared a room so we could be together and talk one another to sleep. Ahhhh to have wonderful friends. I had goosebumps when they called my name and I won Miranda's new book, "Punchneedle The Complete Guide". Woooo Hoooooo I wanted to jump up and hug her on the spot. You'll be so pleased to hear that I did not give in to my impulse. Instead I smiled very wide and said, "Thank You Marinda." Marinda and her new book. She is such a beautiful woman. I wish my picture would have come out better. But it didn't so you will have to just imagine her beautiful eyes and smile. Marinda said that any type of thread that will go through your needle and stay in your cloth can be used for Punchneedle. Now that is a gal after my own heart. Different threads make different textures and leave different sheens. My girlfriend, Starr, told me the same thing. These ladies have over 60 years of experience between them so I'm guessing they really know what they are talking about. Punchneedle is fun and not very difficult to learn. It does take a little practice but honestly you will be able to make something fun in just a few hours. I prefer the Super Luxo needles but I don't use the handle. Starr taught me to put the needle into a pencil eraser and punch using just the needle. I think there are 4 needles in the Super Luxo set....it is late and I'm tired...so don't quote me (you've probably learned by now not to ever quote me anyway....it could get you into a lot of trouble....it does me) ....check my site under Punchneedle and the pictures are there. These are some overhead pictures I took of the Quilt Market while they were setting up. Does this give you an idea of how big the convention center is? It was huge. I don't know how many vendors were there....I should look that up someplace in all my paperwork. I'm writing more about my adventures and getting them ready to be published. I'm going to be featured on Little Birdie Secrets reader appreciation giveaway this week. 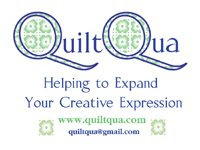 As soon and that is done I will post a giveaway from Quilt Market. I'm also in the process of putting two contests together to give some lucky readers an opportunity to create something original for two designers. Oh so much fun!!! These are Dovo scissors. I had never heard of Dovo prior to Quilt Market. I have always thought Gingher scissors were the best and nothing compared. Well...guess I was living in a cave. These scissors cut like 'buttah' girls. You may have to give up you car to buy them but who cares about driving when you can have these lovely sewing scissors right? Right!!! I'm walking and I'm OK with that....a bit tired....but it's OK....that is what I'm telling myself anyway :) I have the paperwork to begin to order these Dovo scissors for my website but they are not on there yet. If you want a pair and know which one's you want....sell your car....then e-mail me!! These patterns are by Castilleja Cotton. They are two sisters and a husband....they don't share him....well....they did not appear to share him.....one of the sisters was married to him....oh geez...I'm really digging a hole aren't I? Anyway....lovely people from Canada and I loved their patterns. They all three design and do what is necessary to take their patterns to market. These are only 2 of Florine Johnson's roosters. I have ordered more and they will hopefully arrive soon. I just loved them. I have no idea why....probably the bright cheerful colors. I hope you love them too.....cuz I'm going to have those soon too. Lori Smith's patterns were just beautiful. I wanted every one she had. She has even designed patterns that when finished will fit into ready made frames. How smart is that? So you go to your local frame shop (or if you are like me....your local garage sale) and buy a frame to fit your piece. I already have a few of her patterns on my site. Soon I will have as many as I can upload!!! This pattern is by "The Noble Wife" and I thought they would be fun for flowers on a purse or as an embellishment on a package. Just too cute to pass up. I liked this pattern for a purse organizer by Studio Kat Designs. I thought others might be interested for their purses and for their sewing notions in their sewing bags. Cotton Ginnys had this Cell Phone Catty. I thought it might make Cat Lovers smile. I think it would also be very nice in punchneedle. Folklorika by Andover Fabrics....coordinating fabrics below. This beautiful assortment is by Avlyn Fabrics. Andover Fabrics Autumn Bounty panel and coordinating fabrics below. I must have lost the label....but I loved it. Exotic Felt Assortment by National Nonwovens. I now live in a tent and walk everywhere I go.....but I do have an electrical cord from the kind neighbors to my tent so I can still sew. Inklingo and a Giveaway ! !